A computerized inventory system made specifically for the auto salvage industry! FastNnet™ is a communication service that enables recyclers to quickly and easily find a part they don’t currently have (and satisfy a customer). Multi-Screen/Windows Networks: There are several ways to expand your Fast Parts system. The most popular method is to integrate Fast Parts in your Windows network. We can either connect to your existing network, or help you get a network up and running. Tag Printer/Remote Printer: The standard Fast Parts system has two printers. One of the printers is for invoices and the other handles all of your white paper printing such as inventory notes, pull slips, reports, and inventory sheets. By adding a remote printer, you can print reports in another office and not interfere with someone printing an inventory sheet. A tag printer can also be added to allow you to mark your loose parts so those parts may be easily identified. Fast Parts includes many reports to aid in managing your business. VIN Decoding is just one of the standard features on our system. By decoding a vehicle, you can find the exact year, engine size, and other pertinent information. All you need is the Vehicle Identification Number to access the information. The Fast Parts inventory system offers you many choices that can help you buy and sell parts all over the country. Using one or more of these options, your parts can be seen by people from Maine to California and from Michigan to Texas. You, too, can select from the huge inventory of parts around the country so that when your customers want a part, they can buy it through you. Our FastNnet option is exclusive to Fast Parts customers. 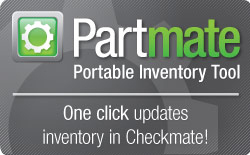 It provides access to inventories contributed by hundreds of Fast Parts users nationwide. FastNnet is the fastest parts locating service in the recycling industry! Car-Part.com lets Fast Parts customers easily and automatically sell parts on the Internet. This widens your customer base and makes your parts visible to people you would not reach otherwise. Trading Partners™ can be included in this service (giving you access to over 4,100 recyclers), as can other specialized tools to help you grow your business. Other networks, such as Hotlines and EDEN® are available to give nationwide access to parts. With the Fast Parts system, you receive the interchange that is known as the industry standard. 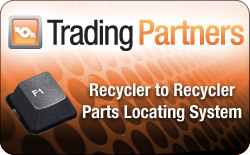 This enables you to communicate with recyclers that use other inventory systems. The interchange is updated several times a year to ensure that you have the most up-to-date information. This interchange is the same one used by Car-Part.com and other networks. This makes it simple and easy to get your parts on these networks. The Fast Parts system with automatic accounts receivable is simple to use. The system automatically adds the transaction to the appropriate account, making it simple to track your sales. There is no need to go in afterwards and post sales to the proper account. The end-of-the-month statements are just as easy. Answer a couple of questions and the computer does the work for you. Once the computer finishes printing the statements, place the statements in a windowed envelope and mail. There are many places in this system that allow you to add accounts as well as edit, credit, and debit with ease. The Fast Parts system allows you to enter your inventory in many ways. You can choose to enter complete vehicles first or loose parts that are stored in your warehouse. For a complete car inventory, you can print a worksheet that is designed for that car and has all of the options printed on the sheet. Loose part inventory is very simple. Place a tag on the loose part and then record that tag number in the computer. You can use handwritten tags or computer-generated tags to mark the part. Computer tags are just one of many options available with the system. The Fast Parts quote feature lets you keep up with quotes you have made on parts. With just a few keystrokes you can save any quote you make so that later, you won’t have to depend on your memory (or that of another counter person). This way, when a customer comes in to pick up the part, you can be confident of the price you gave. You can even record the quote when the part is not from your facility, including what you were going to pay for the part and if shipping was included in the price. This feature alone will help you keep better customer relations and help you run your business much smoother. LEARN MORE or CALL boB CLARK at 800-288-7415 TODAY!